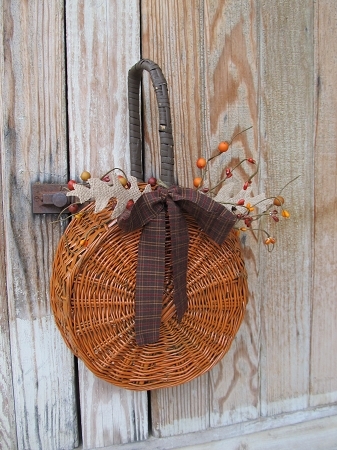 Primitive Pumpkin Shaped Repurposed Basket Decoration. I found this neat antique basket at a sale. It was filled with old spools of thread, which my Mom loved. I was left with the basket. It is a unique shape with the handle and all and as I looked it I saw a pumpkin! So that's what I did with it. Painted it up like a pumpkin. I've decorated the top with some fall colored pip berries, 2 burlap leaves and a brown homespun bow. Hang it up and you have yourself a very unique and fun piece to decorate with this fall. Size is 15" High x 10" wide. A hand painted one of kind by Heidi.